Prefer the classic Grilled Cheese Sandwich? Click here! if your cheese is too thick it will not melt properly (lowering temperature and extending cooking time may compensate for thicker sliced cheese). Experiment and learn. It's only a cheese sandwich! Butter both pieces of bread. Place the first slice of bread in the pan - buttered side down. Using the fork, mash the jelly to a thin layer on the bread in the pan. place the cheese, in an even layer, over the jelly; and place the second slice on top - buttered side up. Butter/margarine goes on the outside of this sandwich. Fry the sandwich until the lowest slice of bread turns golden. Flip the sandwich and fry the other side, squeezing the sandwich in the pan to flatten it slightly, until the other side is golden. 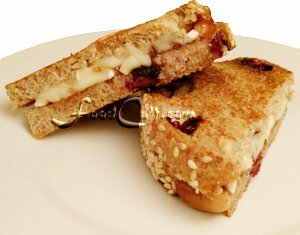 Tricks & Tips: cheese sandwich tips and cooking options: While they are usually fried in a pan or on a griddle, Grilled cheese sandwiches can also be cooked on a grill/barbecue or on a sandwich/panini press. We found a cast iron press for a grill which, coincidentally, fits our favourite pan perfectly, however, it would work equally well on any larger pan, grill or griddle. To help reduce fat a little, melt some butter in the bottom of the pan and wipe the top of one slice in the buttered pan and set it aside. Add butter back to the pan and, when melted, wipe the bottom of the other slice in the bottom of the pan. Leave that second slice in the pan and build the sandwich right there in the pan. Put the first piece of bread on the top (butter side up) and finish frying. To add a fresh taste to your grilled cheese sandwich, try adding a slice of tomato (up to, about, 1/8 inch [3.5 mm] thick). Stack it, first piece of bread (buttered side down), the slice of tomato, the cheese and then the last piece of bread buttered side up. This Toasted Cheese Sandwich is another result of today's, Grilled Cheese renaissance. Our own adventure started with impromptu, apres-ski sandwiches. We would come home from a day in the Laurentians (in Quebec). We were invariably hungry. One evening we came home with family and were just starved. Out came the electric griddle. We never had commercial white bread and rarely a pre-sliced cheese - single-wrapped or otherwise. What we did have was a loaf of Jewish deli rye, and a whole lot of a medium Dutch Gouda. To the surprise of our guests, these traditionally prepared (buttered on the outside - a slice of cheese on the inside, fried to perfection on each side) sandwiches where both delicious and satisfying! That was in the early to mid 1980's. Today we use the breads we make. Sometimes they are deli-style rye. Other times they are, like the bread used in this illustration, a little more exotic - in this case, a mostly organic, fibre enhanced, light whole wheat, cranberry-cashew bread. Our "go-to" bread for these kinds of (diner) sandwiches is a mostly organic, high-fibre (high quality fibre supplements), light whole wheat. The only breads which do not work well are those dense European pumpernickels and rye bread (like the German and Dutch pumpernickles). A softer structure, western style bread has nicer frying characteristics. This is no longer the diner classic, usually served with potato chips (crisps, for our English friends) and/or a dill pickle ... and it's no longer the always inexpensive, tasty treat. This particular variety of flavour options is one of the really fun ones. This is the only jelly flavour I personally like for a grilled cheese. We are careful to pick a very high quality jelly - free of extrenuous ingredients. For us, the only rule for a grilled cheese is that the cheese must be the star, and the bread is the supporting love interest. Looking for the classic grilled cheese sandwich? Click Here!